There are now 2 inches of plain knitting done on the Passionate Purple Petal socks (which has me thinking of a P word for socks (pedi-clothes? ))to make an over the top title! Another inch or inch and half, (a commute!) and it will be heel flap time!—and then, even with a fancy multi colored heel flap, they are all but done! I plan to do some of the much needed finishing (weaving in of ends) today at work. I didn't bother to photograph--they are longer, but really unchanged. A much simpler fancy cuff; a button band, worked in a solid black seed stitch, and a body of Kroy Jacquard sock yarn (slate jacquard—various shades of grey) Perhaps there will be some clocks knit in, too, but mostly the socks will be plain; I’ll let the self striping sock yarn do most of the design work. (and plain knitting means fast socks! )The will have solid black heels, too.. (and likely matching toes, as well)--they are photo shy for the moment--and hiding from the Passionate Purple Petals, too! 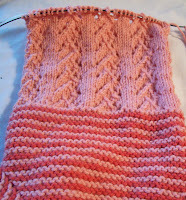 Right now, (the 8th repeat of the lace pattern started, but not completed) the sleeves of Peachy are 8 inches long. Based on FL, I should aim for sleeves about 12 inches long—or another 2 and half repeats of the lace pattern, + the garter stitch hem. I am also aiming for finishing it up this weekend! I think I have enough yarn for this--and if I don’t, well I’ll live with 11 inches long sleeves! I have 2 more skeins of this color yarn, but in a noticeable different dye lot. Certainly not a close enough match to use on this garment—but fine for the semi matching hat or pair of fingerless gloves I have planned. I am aiming to finish this sweater this weekend, or more precisely, finishing up the knitting. I made 1 button hole –but I am not sure I want a button closure--it won’t be hard to graft the single button hole closed if I decide on something else. I’ve looked in various places for buttons and clasps, and haven’t found anything that exactly suits—nothing in the right color, or the right size. I might end up with clear snaps (to really hold it closed) and a shawl pin for style.